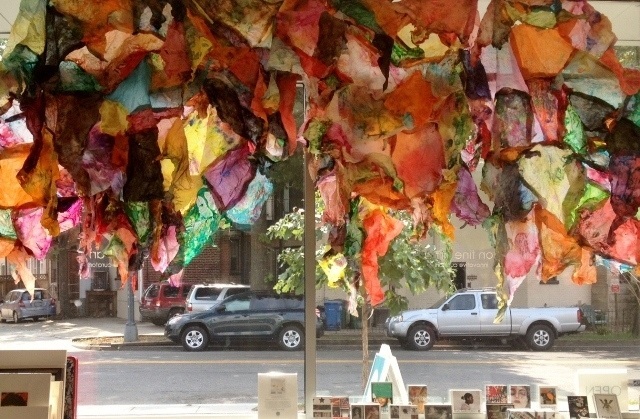 Maya Freelon Asante looks at global issues, including war, poverty, waste, beauty, and aging, and makes works which demonstrate her passion to share about these issues. She takes tissue paper, uses water to transfer the pigments onto another paper, and the presses. She makes Tissue Ink Monoprints which look at deterioration and the idea of us staining our history and future. Finished last project! very relieved. Happy with how it turned out but wish i had prepared more fabric to have made the bottom have thicker. More work, its going slow but i like how it looks. I visited the VMFA with friends just for the fun of it and was drawn to the exhibit on women from abstract expressionism. I remember really enjoying learning about this movement in class, and so it was neat to get to see a different focus of this movement and see pieces in person. I noticed that the colors used seemed to be more dull or timid than many of what I remember we looked at in class, which was interesting. Much more pastel and muted colors than i was expecting. Part of this could have just been which pieces were specifically chosen, and so i think planning an exhibition is a relay important step of displaying artwork and a message. Started next project. Excited as to how it might work out. Cut, died, and started tying fabric. Paul Anthony Smith works with mixed media to create unified works. He uses printmaking and sculpture in combination with his photography to create interesting works. 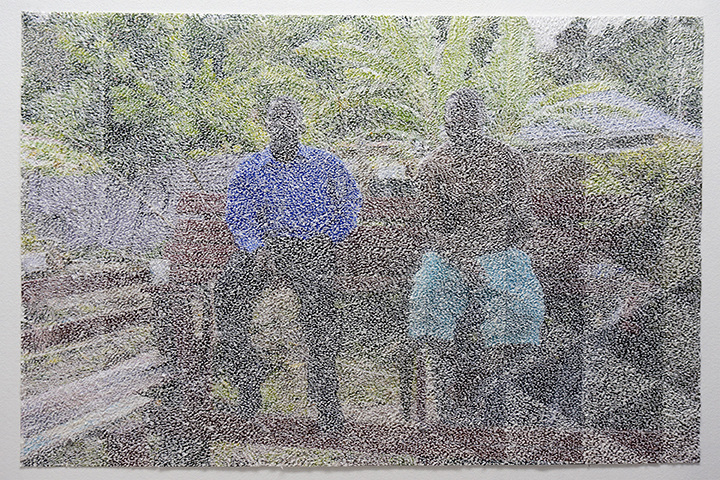 His pieces come from inspiration from his home country, Jamaica, transforming images of his community in the process. The role which art can play in politics and politics can play in art is one which is fluid and yet very rarely transparent. While there is often a connection, it can be difficult to tell what role art should play in political world. Talking Politics 2008, is an article which takes 6 artists connected to politics through their art of varied backgrounds, and leads them in an open discussion about the role art plays in the world, specifically in relation to politics. One of the main themes that came out of this article was the growing nature of the connection between aesthetically pleasing and social commentary artwork. These artists have found that they overlap, its rarely just one or the other. One mentioned that "visual art's aesthetic dimension helps clarify its meaning." (Talking Politics 2008, pg 3) The connection between the two is valid, and is essential for greater understanding now, as well as to serve as documentation for the future. Artists recognize that they must be smart in how they present their piece, making it visually interesting so people will then spend the time to get involved with the work and determine deeper meaning from it. This concept really made me think about how much art might have been made in the past, that had a good meaning, but lacked the pizzazz for the piece to be considered later in history. I felt like there was also interesting commentary in the article about the art market, and sales. Art has to be profitable, and sometimes I think an artist must choose between their values and being successful. If the rest of the world feels a certain way, it's easier for artists to fit in, rather than find a way in. Earlier in the year we read an article about protest art. In one of Jimmy Howerton's articles in response from Q1, he really mentions some ideas which connect to those mentioned in this article. He mentions how many news stations are sectioned out on what they report on based on their political standing. That people avoid others opinions, causing us to become more polarized. I feel like that idea is mentioned in this, when the artists are talking about selling work. If you give in to the wants of a group of people, and only make art for them, you can be successful. But is it worth it to give up what you value? Art is "highly monetized" (pg 5) and people will sometimes make art just to make money, like with protest art and the news stations who streamline their opinions to only fit their viewers' ideals. Overall, I think the article did a great job in giving readers a variety of perspectives. At sometimes it was difficult to read due to the nature of the open table, but it was informative. I think the art world really needs to think about, moving forward, the reason why we should create art. It should ahve a purpose, one that encourages discussion and questioning, rather than simply agreeing and staying safe on your side of the court. Got lots done on my home project. Like how it turned out. I really like the texture, but wish I had spent more time on the colors. Finished up 2nd Q3 project. I like how this turned out, wish it were a little longer or had more fabric. Susie Ganch is American born to Hungarian parents. 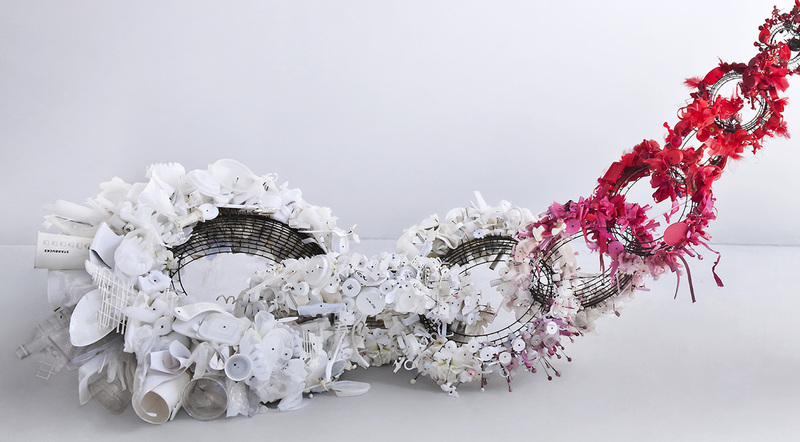 Her work consists of things from small intricate jewelry, to large filling sculptures. Her sculptures are large, and are made of lots of tiny pieces assembled together. She lives in Richmond now, and works as a teacher, sculptor, and jeweler. Her work focuses on permeability and interconnectedness. Susie Ganch: TIED from Visual Arts Center of Richmond on Vimeo.